This month, I shall give the winner a magic trick. 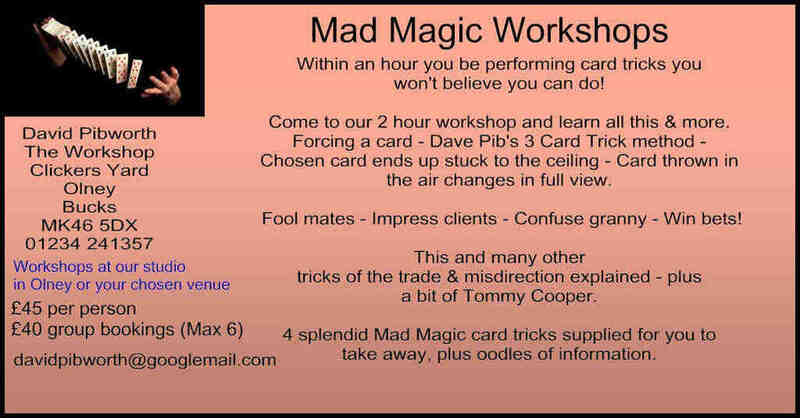 Some of you may have seen me throw a pack of playing cards up in the air and make your chosen card stick to the ceiling occasionally at places like Costa in Olney and I'll teach you how to do it and even supply a pack of cards. You will need to come to my office in Olney for tuition, or I can come to you if you're local, but it doesn't take too long. About 25 minutes I'd say. Jokes are interesting and as comedy writing is part of my job, I've studied them to some degree, but the thing with jokes and gags is that you don't need to look too deeply. If they're funny, they're funny. Humour is very subjective and as far as I'm concerned there is nothing you can't joke about, but in my opinion very silly jokes are usually the best. If you notice children telling jokes, they often 'get' the construction of a joke, well before they 'get' the actual idea of what material to put into them. My daughter got the rhythm of the 'Knock Knock' joke well before the actual joke. "There's a musical quality about a joke." I wander around our kitchen working out the best way to tell certain jokes and ad libs and where to leave pauses (as my wife will wearily confirm) and the art is to make it look as if it's the first time you've said it. The fact that Morecambe and Wise never ad libbed should give you an idea of how important it is to rehearse them. Jokes can't be copyrighted so you'll see here I have a selection from various comics just to get your mind working. Just write them in the same way as you would tell them. "I went to the doctors today and said, 'I can't say my F's, T's or H's' and the doctor said "Well, you can't say fairer than that". "I just met a man called William Hill. What are the odds on that?" "I phoned up the Lib Dem Central office today and said: 'I'd like a copy of the Lib Dem manifesto please.' The lady said, 'I'm sorry, but we've sold out.' I replied, 'I know that, I just want a copy of your manifesto.'" "I cleaned out the attic yesterday with the wife. Dirty, dusty, covered in cobwebs ... but she's good with the kids." "Jurgen Clopp has ruled himself out for the Manchester United managerial job. However he said his brother, Klipperty, may be interested." "I stood at the bus stop having a smoke and was surprised to see the bus leaving before its scheduled time. Funny, I could have sworn I'd put the handbrake on." "A friend of mine always wanted to be run over by a steam train, so when it happened, he was chuffed to bits." "So I told my girlfriend I had a job in a bowling alley. She said 'Tenpin?' I said, 'No, it's a permanent job.'" "So that's the kind of thing I'd like you to comment below with." People say that the art of joke telling has been lost and while I don't agree especially with that, I think it's as well to keep everyone thinking about it, as it is important. So do start commenting below and we can keep people laughing or give them a nice gag for a speech to cheer up networking meetings. "It's been terrible weather recently. My missus just sits there looking mournfully through the window. If it gets much worse I'll have to let her in."